The pendant measures 2.8cm x 2.8cm. It's made of two layers of glass. A layer of Pale Blue translucent Dichroic glass topped with a layer of clear glass. 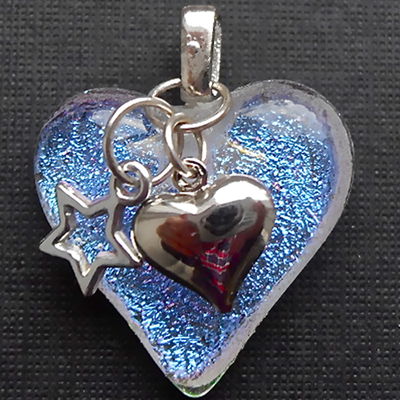 The heart shape is 1.2cm x 1.2cm and the star is 1cm x 1cm. It comes with a 16" x 1mm Sterling Silver snake chain in a Black card giftbox.